***typepad was wonky for me last night. I was not done with this post and it would not allow me to continue. I will do another post later with more info. and photos. HAPPY MOTHERS DAY and HAPPY BIRTHDAY SWEET MCKAY- I LOVE YOU!!! Are you ready for the details from yesterday???? Be prepared for lots of photos. I have SO many photos, that it was hard to decide which one to share. 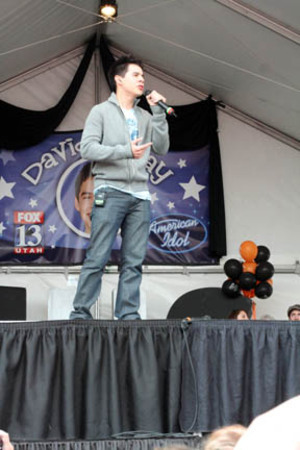 David sang three songs for his fans. 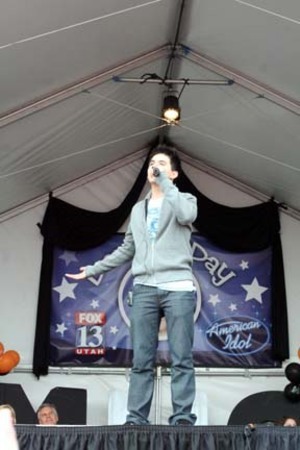 He was OVERWHELMED with the thousands of people who came to see him. David had no idea so many people would show up. 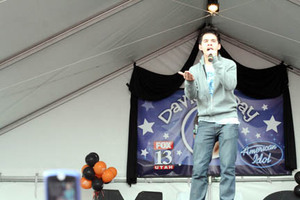 He performed at the high school- stage on one end of the football field. We were so lucky to be in the reserved spot- right up front. It's so evident that so many people have been inspired by this young man. He had fans from across the nation show up. One girl gave him a scrapbook. Taylor saw it, but I was busy helping blow up 3,000 balloons. Yikes! 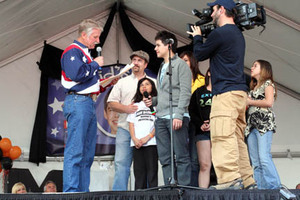 I wanted to show this photo of Mayor Snarr (Murray Major) telling David that yesterday was officially David Archuleta day. That is David's dad (hat), and family. He has one brother and three sisters. That is American Idol's camera man shooting the moment. David with family again. His mother is in yellow- somewhat hidden. I think she is beautiful. 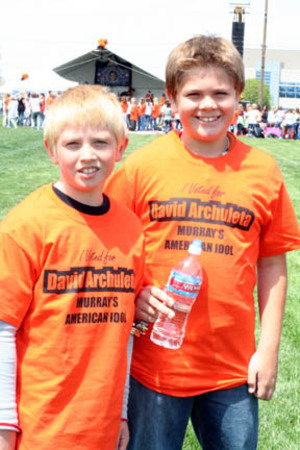 David's brother, Daniel is in the black t-shirt. He is a gifted athlete. Also, he sings as well. He will be singing a duet this Thursday at the choir concert at the Jr. High. McKay says he is quite the singer too. 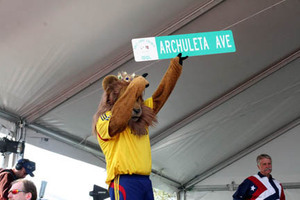 David was given a street named after him. This is a view from the stands before David showed up. Police had to stay overnight in the parking lot, so that people could not take the students/facility parking. When I arrived shortly before 9 am, I saw only three parking spots. It was a MAD HOUSE. 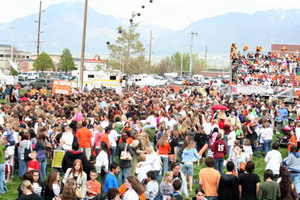 The police said there was so many people, we had to open the doors early at 1:15 instead of 3:30 as planned. I was hanging banners and I saw all these people RUNNING across the football field to get to the front of the fence. I had to stop doing what I was doing, to help deal with the crowd.